Visitors to the Australian Botanic Garden Mount Annan can now find giant, extinct creatures lurking amongst the plants thanks to a free new app created for National Science Week and supported by inspiring Australia. 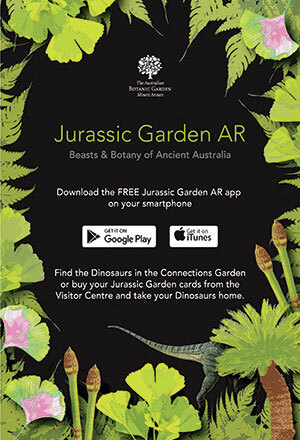 The Jurassic Garden AR app is free to download and easy to use, with QR code markers found in the Connections Garden to indicate where the creatures are found. With the theme “Beasts & Botany of Ancient Australia”, the app currently features two dinosaurs and two extinct megafauna that appear as moving, 3D creatures when using the app on a smartphone or tablet. The creatures are matched to plants that would have once been part of the animal’s habitat or diet, such as the Wollemi Pine which is considered a “living fossil”. Australovenator wintonensis, Australia’s answer to Velociraptor! Visitors are already taking and sharing photos with the creatures by using the app in conjunction with the camera on their mobile device. The app was developed by Australian augmented reality experts Eye Candy. Visitors can also purchase a set of four, fact-filled ‘trading cards’ from the Garden Visitor Information Centre for $6.00 that support use of the app at home. Vanessa Barratt is the Science Communicator, Botanic Gardens & Centennial Parklands. Download the free Jurassic Garden AR map from Google Play or iTunes.